Excursions and land arrangements include some extensive walks, often over rough surfaces. Cobblestones are used in many European cities, making walking more difficult. Access to some decks and to shore in some ports may involve steep steps. Members should be in good physical condition, able to walk a kilometre or more without assistance to fully enjoy this cruise. We are very pleased to offer once again this exciting itinerary to the Douro River and the great maritime city of Lisbon. This unique itinerary will delight river cruisers and those who love to explore the Old World. Our journey takes us to Lisbon, the city where most of the Portuguese expeditions in the Age of Discovery started their voyage. 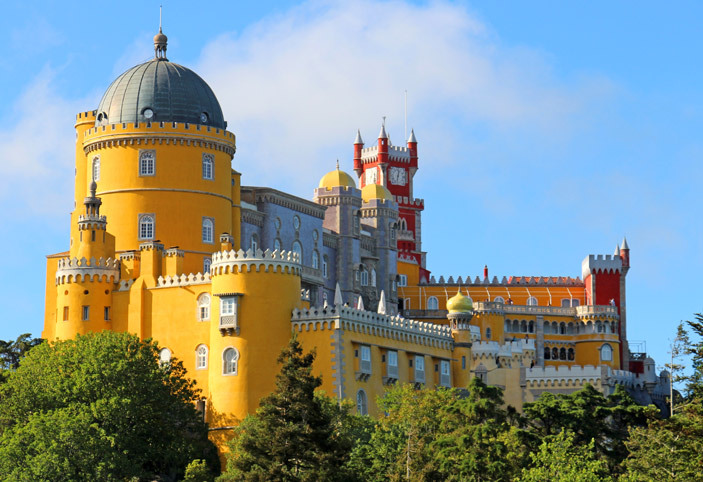 We will spend three days here with many opportunities to explore its rich heritage and surrounding towns including Sintra and Fatima, one of the holiest places of pilgrimage on earth. 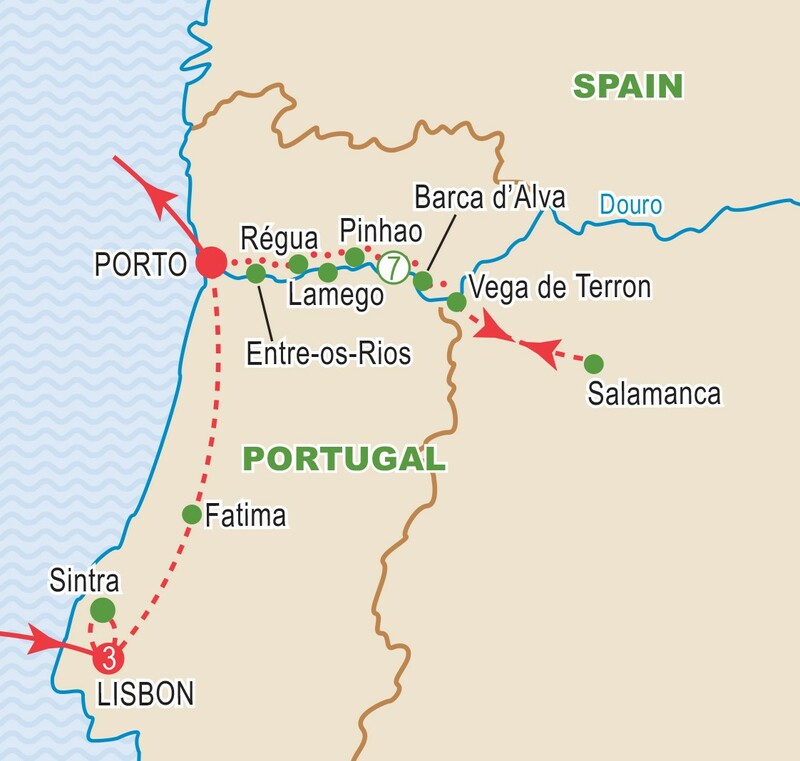 We begin our cruise in Porto for seven nights of discovery up the mighty Douro River, a major waterway of the Iberian Peninsula. The banks of the Douro are peppered with villages and vineyards that are uniquely Portuguese. 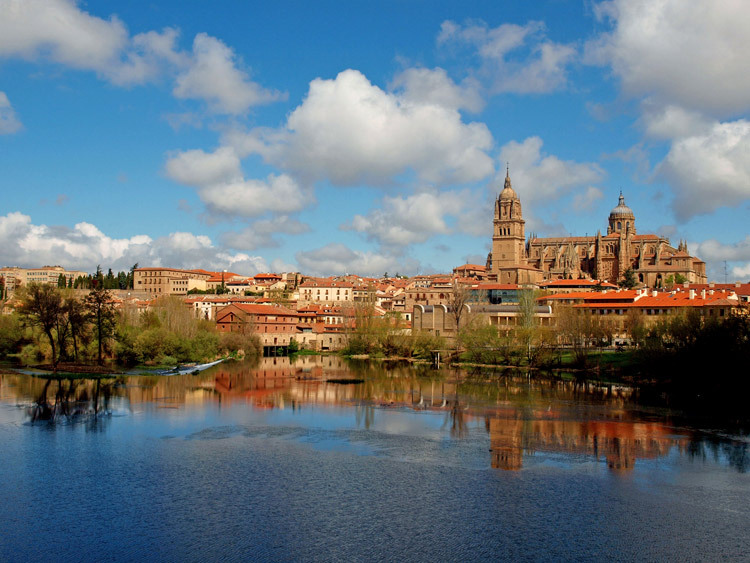 We also take the time to visit the UNESCO World Heritage Site of Salamanca, Spain, a gem of beauty and history, boasting the world’s third oldest University. Our cruise ship the ms AmaDouro will debut in the 2019, bringing the distinctive standard of excellence of AmaWaterways. Accommodating only 102 passengers with balconies in the majority of its spacious staterooms, we will most certainly cruise in style. 1 Cat. D cabin left! Book and deposit by April 30, 2019 and save $200 per person! Tour members from across Canada fly to Lisbon. 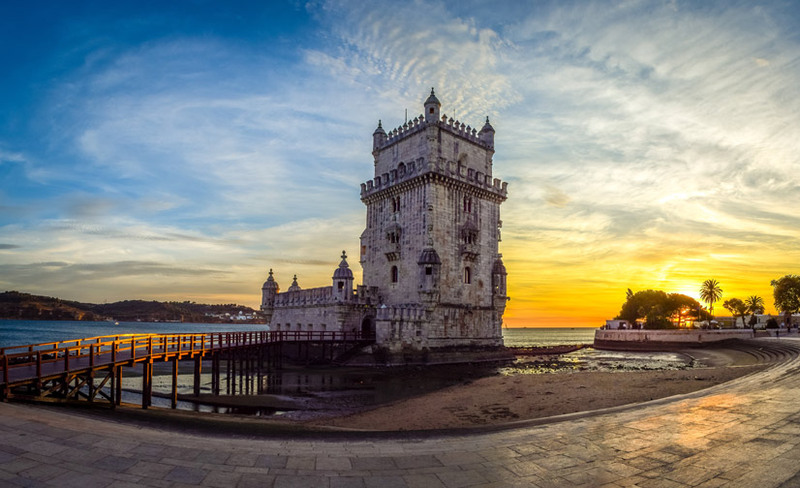 On our city tour this morning, see the Belem tower, a fortified tower made of limestone and visit the spectacular 16th century Jerónimos Monastery. We shall also visit the city’s most famous site, the Discoveries Monument. 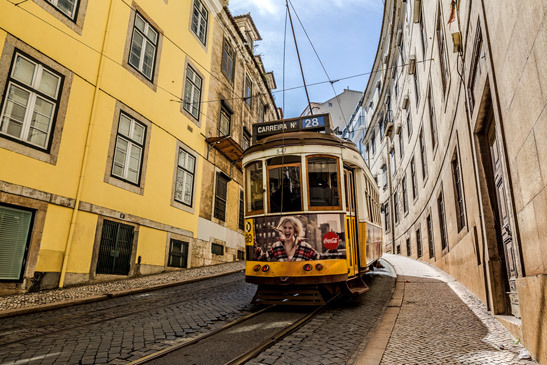 This afternoon there are a number of interesting sights for you to consider such as the Castle of São Jorge, Lisbon’s state of the art Oceanarium or the famous Santa Justa Elevator which oversees the Castle, the river and Rossio Square. Enjoy an excursion to Serra de Sintra, one of the most delightful mountain villages in Portugal. High up on a rocky peak sits the Pena National Palace, a wonderful example of Portuguese architecture from the Romantic Period. Afterwards enjoy some free time. 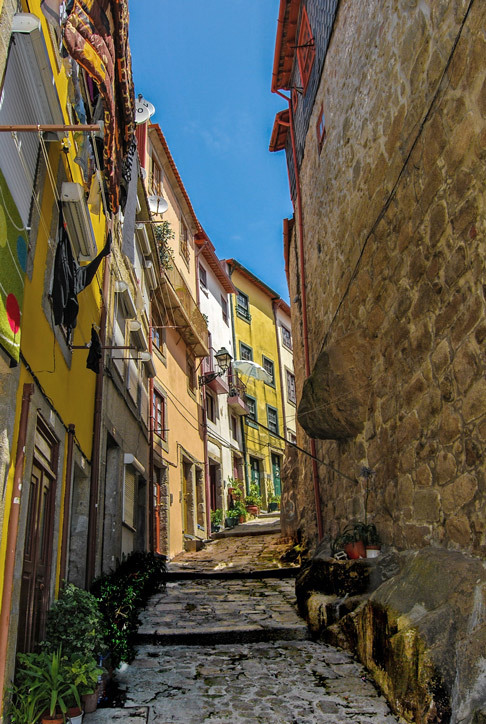 This afternoon, we will have an excursion to ancient and picturesque Lamego, home to one of the most important pilgrimage sites in all of Portugal, the Nossa Senhora dos Remédios (Sanctuary of Our Lady of Remedies). The shrine features a staircase of nearly 700 steps, beautifully decorated with white and blue tiles. Other attractions include a Gothic cathedral, a museum, and charming cafés. Our tour concludes with a tasting of local specialties, such as Bolas de Lamego (bread filled with smoked ham), Presunto (dry cured ham), and Espumante (sparkling wine). views. We will also taste some delicious locally grown produce. This morning we depart for a full day tour to Salamanca, a UNESCO World Heritage Site. Built of golden sandstone, Salamanca is known as a “living museum,” an opportunity to step back in time to the Middle Ages. During our guided tour, we will see the city’s elegant university buildings, the twin-towered Cathedral, the intriguingly decorated House of Shells, as well as the Plaza Mayor, considered the most magnificent main square in Spain. Later today we enjoy a Flamenco show in Vega de Terrón. Douro region. Later we visit Quinta do Seixo to tour their wine cellars and enjoy another tasting while we learn about the centuries-old winemaking methods they use. 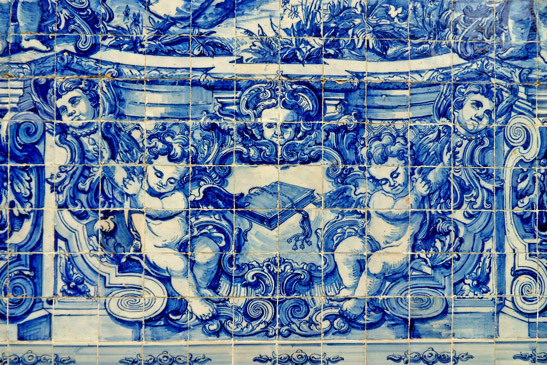 This morning we sail for Régua and enjoy an excursion to the Palacio de Mateus. The palace and gardens are situated in the beautiful region of Trás-os-Montes, a remote and scarcely populated area of Portugal. Later enjoy a glass of wine and the breathtaking view from the centuries old Alpendurada Monastery, followed by a traditional home cooked meal. This morning, enjoy the beautiful city of Porto with a guided walk through the historic quarter, a UNESCO World Heritage Site. See the cathedral, one of the city's oldest monuments and the São Bento Railway Station, known for its blue and white tile panels depicting scenes from Portuguese history. Enjoy a tasting of Port, Portugal’s most renowned contribution to the world of wine. Our journey draws to a close as we disembark and catch our flights bound for Canada and home. The spectacular AmaDouro is set to debut in 2019. Like other AMA ships the AmaDouro features spacious and well appointed staterooms, most of which include balconies. Panoramic Window Staterooms are 161 sq. ft., Balcony Staterooms are 215 sq. ft. while spacious Suites are 323 sq. ft. Suites feature sitting area with chairs, and all staterooms feature complimentary internet access and Wi-Fi as well as in-room safes, hair dryer and ample closet space. Plush bedding, terry bathrobes, flat-screen TVs and full marble bathrooms are signatures of the AmaWaterways fleet. Complimentary bottled water is replenished daily. The AmaDouro also features a Sun Deck offering unimpeded panoramic views with lounge chairs and a swimming pool, as well as a fitness centre, spa, and lounge with bar. The Main Lounge with bar and piano is a relaxing way to spend an evening. Dining is a delight with sophisticated cuisine drawing on the best of the region with gourmet and al fresco options to compliment the freeflowing local wines at dinner. The AmaDouro carries a maximum of 102 passengers in 51 staterooms and 4 suites. Onboard are a crew of 38. Rates are per person based on sharing a Cat E Outside Twin on Douro Deck. Stateroom categories are subject to availability at time of booking - book early for best choice. See Deck Plan for full details on various categories available. Singles are extremely limited - please ask for rates. Prices are based on taxes, surcharges, airfares and exchange rates effective June 2018 and are subject to change. Cruise price is based on sharing a twin-bedded stateroom with private bathroom and a minimum of 20 travellers. Airfares from other gateways are available on request. Airfares and air carrier are subject to change and will be confirmed prior to final payment. Refer to Inclusive Features for details. Prices DO NOT INCLUDE the cost of insurance which is available and is highly recommended. Premiums vary with the cost, length of the trip, and the traveller’s age. For passengers up to and including 74 years on departure date, premiums will range from $280 to $486 pp plus applicable taxes. Cost supplements for travellers aged 75-85 will range from $186 to $404 pp plus applicable taxes. This insurance is effective from the date of purchase and carries limitations on pre-existing medical conditions. Please discuss your insurance coverage prior to booking. Refer to our Terms and Conditions for more details.